Nicole joined Summit in February of 2017 as receptionist. Prior to joining Summit, Nicole worked as a primary router at MXD Group Inc. in New Albany, Ohio. Nicole graduated from The Ohio State University in August of 2016 with a Bachelor’s Degree in English with a concentration in Literature. A Columbus, Ohio native, Nicole is originally from Hilliard. 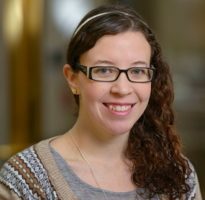 Nicole currently spends her time at home with her husband, where she enjoys movies, reading, writing, running, and time studying the bible with friends.